Lucie Zvolska is a doctoral student at the International Institute for Industrial Environmental Economics (IIIEE) at Lund University, Sweden. Currently, she is working together with a team of seven researchers on the project Urban Sharing: From Excess Economy to Access Economy, which aims to examine the design of sharing organisations that develop in cities, their sustainability impacts on urban citizens, and how they grow and gain legitimacy. The team is doing comparative case studies on urban sharing in eight cities around the world: Berlin, London, San Francisco, Amsterdam, Melbourne, Seoul, Toronto and São Paulo. 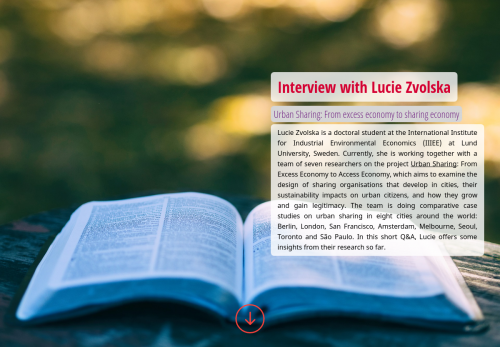 In this short Q&A, Lucie offers some insights from their research so far. Can you share the background and some insights from your research? Proponents of the sharing economy, or as we call it, urban sharing, claim that sharing is beneficial to the local economy as money is spent in the community. At the same time, it allows local people to earn extra money to pay the bills, a task which is becoming increasingly difficult after the recession. Advocates of urban sharing also believe it strengthens the feeling of togetherness and fosters social interaction because it connects people in large cities who otherwise would not have met. It is even said to be good for the environment because the more we share, the fewer things we potentially need to buy. While it may sound like a panacea to many problems cities are facing today, we have to be careful not to jump in conclusions without a rigorous evaluation of its promises. Urban sharing comprises hundreds of business models and unique platforms, which impact cities in different ways. If we wish to discuss the impact of the sharing economy on our cities, we must understand the interplay between individual sharing platforms and the specific needs of urban citizens and cities. For this reason, I am working to understand how urban sharing organisations operate. I have explored the business models associated with accommodation sharing, and while most people will immediately think of Airbnb, there are other rental platforms offering peer-to-peer, short-term accommodation. On top of that, there are also “free platforms,” where accommodation is offered for free, such as Couchsurfing or BeWelcome, and “reciprocal platforms,” where people swap houses, such as HomeExchange. Each type of these platforms will have different impacts on cities, and thus far, cities have been focusing mainly on regulating rental platforms. Another example is mobility sharing, which has been studied longer, but there are still gaps in knowledge about its impacts. Like accommodation sharing, it comprises many business models, such as inter-city and intra-city ride sharing, station-based B2C car sharing, free-floating B2C car sharing, or P2P car sharing. Unsurprisingly, each model will provide different benefits and threats to cities. Free-floating car sharing might worsen congestion, especially in the centres of densely populated cities, and lead to an increase in greenhouse gas emissions. On the other hand, station-based car sharing, also known as car clubs, has been shown to reduce the number of cars on city roads because it leads to a shedding of private cars and a replacement of some car journeys with public transportation. Many cities have taken a reactive approach to urban sharing and regulate the large and the loud sharing organisations. However, there are other tools available to govern sharing organisations. Together with my colleagues, I published a paper in the Journal of Local Environment, where we discuss the different roles cities undertake to govern urban sharing. They can take on the roles of regulators, providers, enablers or consumers. As providers, they can support sharing initiatives by providing infrastructure, premises or funding. For example, Berlin designated parking spaces for shared vehicles, and London established the London Co-investment Fund, which has funded two sharing start-ups, Hubble and Flat Club. Enabling is the “soft” approach to governing, by coordinating or facilitating partnerships. Municipalities can for example educate city dwellers about specific sharing platforms or about the benefits of sharing in general, or they can offer partnerships. Cities can also support sharing as consumers either by using sharing platforms themselves, or by initiating their own sharing programmes. Can you give an example of a city or a (best) practice, from which city leaders all over the world can learn? So far, I have explored urban sharing in Berlin, London and San Francisco. These cities have employed various forms of governance to harness the potential sustainability benefits of urban sharing. For example, both Berlin and London have issues with air pollution, so they have focused on governing mobility sharing. London actively discourages private cars in the city centre, and supports public transportation and car sharing. They have also partnered up with the parking space sharing organisation JustPark, which decreases the time drivers spend circling around trying to find a parking space, thus minimising air pollution. JustPark was selected by the Mayor of London to represent the city at the Smart City Expo World Congress. Berlin supported shared mobility by designating parking spaces for shared cars, as mentioned above. These spaces were initially meant for car clubs, but started being used by new coming free-floating schemes, which disrupted the infrastructure used by the existing car clubs. This shows that the sharing economy is moving rapidly and city officials must be prepared to act fast in order to harness its potential, but also to mitigate its negative impacts. Still, Berlin was forward-thinking in trying to encourage station-based car sharing. Due to its geographic location by the bay, San Francisco does not have as big of an issue with air pollution as London and Berlin do. Therefore, all types of shared mobility, especially ride sharing, are booming and are left to develop on their own. The three cities have a housing shortage and are regulating short-term rentals in similar ways. London and San Francisco introduced a 90-day cap on rentals where owners are not present (the so-called “entire home” rentals). San Francisco has proven to be especially resilient in enforcing its regulations, and imposed strict rules to keep long-term housing on the market, and even endured a joint lawsuit by Airbnb and HomeAway. Consequently, the Office of Short-Term Rentals was established to enforce the rules. Recently, Berlin has also introduced the 90-day cap on second homes, and requires registration from home owners who wish to rent their homes on sharing platforms. From your findings so far, what are your recommendations to city officials? In order for cities to take advantage of the potential benefits of sharing platforms, they should understand their impacts, and choose how to best govern them based on their merits. While city officials focus on regulating the large players, it might prove beneficial to also explore what smaller and non-profit platforms are already available in the city and their impacts. These small-scale organisations are often community-led initiatives with great sustainability potentials that could help cities reach their sustainability goals. Conversely, there are many small-scale tool sharing, food sharing or bike and car sharing initiatives that could greatly benefit from the support of the municipality. Would you like to start a conversation on this topic or share related research (findings)? Feel free to reach out to us.